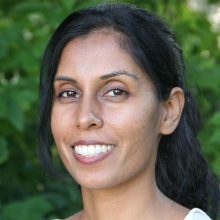 Jina brings 13 years of experience in the for-profit and non-profit sectors, working alongside government, the UN and corporations, to craft and implement solutions to enable refugees and immigrants to integrate into the workforce. At HIAS, she was charged with reshaping and building the agency’s economic integration programming in the U.S. and internationally, bringing clear outcomes, strong evidence and collaborative partnerships with the public and private sectors. From 2013 to 2016, Jina started the Near East Foundation’s refugee portfolio in Jordan and Lebanon, advising the U.S. Department of State and USAID on Iraq and Syria response, and initiating the One Refugee Response. Jina has been interviewed on Aljazeera America, the New York Times, Huffington Post, and the Guardian, and published in CNN, Times Magazine, and other news outlets. Jina co-chaired, alongside UN Women, an international network of agencies to advance women and girls. Jina earned her MSc in Comparative Politics at the London School of Economics and a Bachelor’s degree in Government from the University of Texas at Austin.